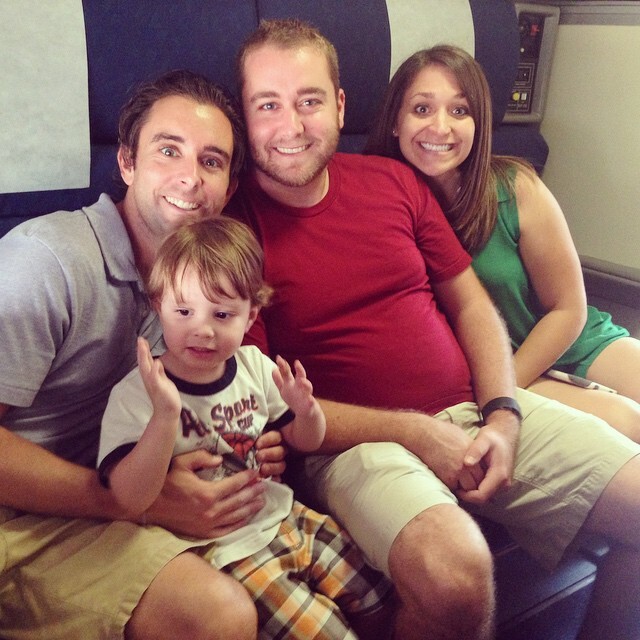 We are fresh off another wonderful vacation with a fresh travel twist — we traveled by train. We left Phoenix on a Thursday evening and flew to LAX where we stayed the night. On Friday morning, we Uber-ed our way to Los Angeles’ Union Station where we boarded the Coast Starlight — a train with a daily route between Los Angeles and Seattle. 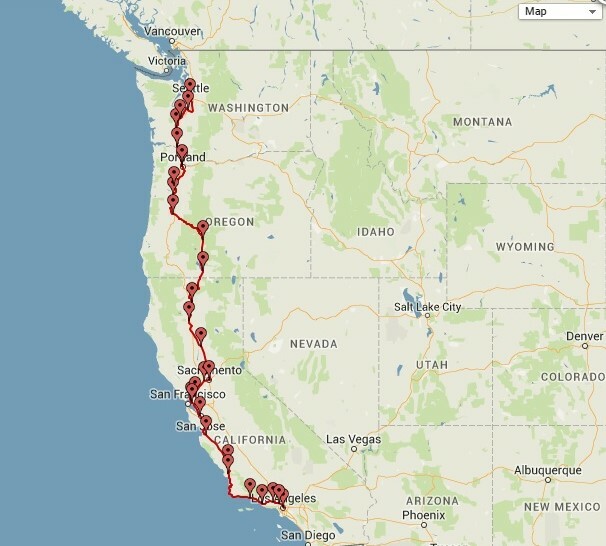 The Coast Starlight train passes through Santa Barbara, the San Francisco Bay Area, Sacramento and Portland on its way to its final destination in Seattle, and is widely regarded as one of the most spectacular of all train routes. 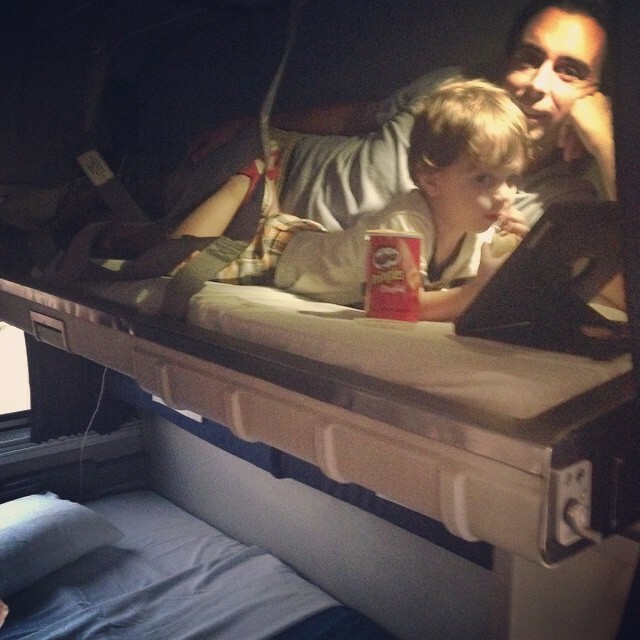 Its a long train trip — about 36 hours total and so we decided to use our Chase Ultimate Reward Points to secure a sleeping car. It was great, a small but efficient little room with a bunk and a couch that folded out for sleeping accommodations. We also had our own tiny water closet with toilet and shower, and a small sink basin. The room made travel comfortable for Tony, Matteo and I. Tony’s parents shared a room the same layout as ours, while Tony’s brother and wife had a roomette — a more compacted version with a shared bathroom. We boarded the train for our departure at around 10 am. We were very surprised at how quiet the train was from inside our room, and how relaxing the gentle motion from the train felt. Matteo loved that we were on a train and wanted to go back and forth between our room, and our family’s rooms. We settled in and prepared to enjoy the ride. The Coast Starlight has a Dining Car and Parlor Car in addition to its passenger cars. The Dining Car required reservations for lunch and dinner, with passengers in the sleeping cars receiving priority over passengers in coach. The Parlor Car was accessible to sleeping car passengers only, and underneath was a theater room that played an animated movie in the afternoon. You could also take in the beautiful scenery from the Sightseer Lounge Car, with large windows and comfortable seats. Because we were in a Sleeper Car, our meals were complimentary (alcohol not included). I’d been warned to expect delays, and sure enough by the second day we were running 45 minutes-1 hour behind. Since we were prepared, the delay didn’t both us too much, though I’ll say by the time we were pulling in to Tacoma, WA (second to last stop) we were all getting a bit antsy and ready to get off the train. I was pleasantly surprised by how comfortable it was to sleep on the train, and the meals were good too. Nothing beats the view from your window as you’re climbing up the coast — what a beautiful country we live in! If we were going to do the trip again, I’d probably get on in a bit father north or get off earlier, something to shorten the trip a bit. Matteo did great, but was a little too young to appreciate the views or understand that we couldn’t get off every time the train stopped. It was definitely a unique travel experience, and we repeated it a few days later by taking the Amtrak from Seattle to Portland — that time in coach seating for the quick, 2.5 hour trip. Traveling by train is relaxing though, and it something I’m looking forward to taking advantage of over the next few years in Europe. Overall, it was a GREAT use of our Chase Ultimate Rewards points and we felt lucky to have the time to take the trip. Up next…details of our first AirBnB rental, our take on the city of Seattle, and wonderful Portland!